Trump Announces David Shulkin As Pick For Secretary Of Veterans Affairs : The Two-Way Shulkin is the VA's undersecretary for health, a position he was nominated for by President Obama. 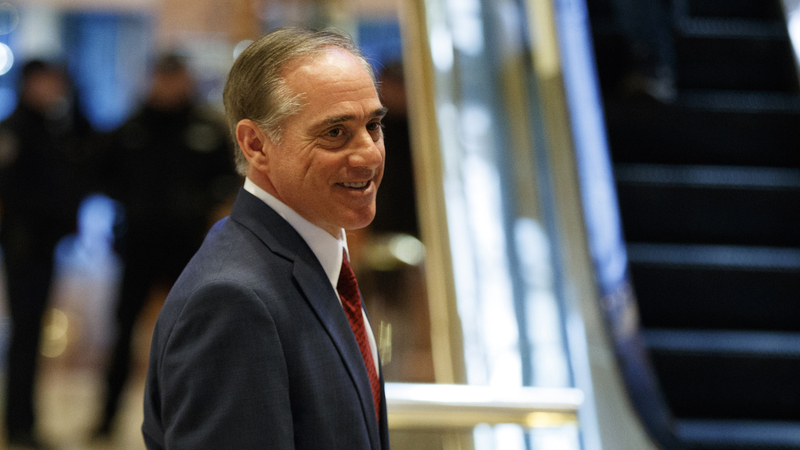 He would be the first nonveteran to head the VA.
David Shulkin, the undersecretary for health at the Department of Veterans Affairs, leaves a meeting with President-elect Donald Trump at Trump Tower in New York on Monday. President-elect Donald Trump announced Wednesday that he plans to nominate David Shulkin to be his secretary of veterans affairs, a position that requires Senate confirmation. Shulkin is currently the undersecretary for health at the VA, which means he runs the Veterans Health Administration. He was nominated for that position by President Obama in March 2015 and confirmed by the Senate that June. Shulkin's official bio says he is a physician — a board-certified internist — and was the chief executive or chief medical officer of several hospitals and hospital systems. He is also an entrepreneur who founded a health care information company called DoctorQuality. Notably, he is not a veteran. As NPR's Quil Lawrence reported last month, the VA has always been headed by a veteran. "I have no doubt Dr. Shulkin will be able to lead the turnaround our Department of Veterans Affairs needs," Trump said in a statement following the announcement. "Dr. Shulkin has the experience and the vision to ensure we will meet the healthcare needs of every veteran." Last year, NPR and several member stations jointly reported on the flaws and failures of the VA's "Veterans Choice" program, which is meant to allow veterans to find private doctors. As the head of the Veterans Health Administration, Shulkin spoke with NPR about the experiences of veterans left waiting months for treatment under the program. "The first responsibility that we have to our veterans is to make sure those that need urgent care are getting care on time. "This is a different VA. We've brought in people from the outside who have private sector experience. And what we're saying is that we have to do business differently. ... We know how to make this program work better." Trump considered a series of possible VA secretaries before deciding on Shulkin — he said on Wednesday that he interviewed more than 100 candidates. Quil reported that the president-elect met with Iraq veteran Pete Hegseth, who favors privatizing VA health care, as well as former Sen. Scott Brown, R-Mass., who is a National Guard veteran. Just-retired Republican Rep. Jeff Miller, who was the head of the House Veterans' Affairs Committee, was a Trump adviser who was also considered a candidate. Both Politico and The Washington Post report that several possible candidates for VA secretary rejected Trump's overtures. The secretary of agriculture and chair of the Council of Economic Advisers are the only Cabinet-level positions for which Trump still has not announced his choice of nominee.